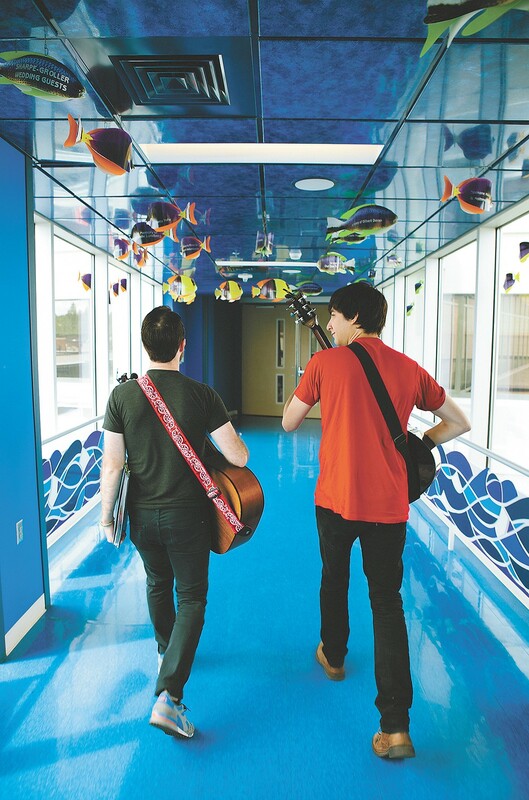 Scott Ingersoll (left) and Miles Martin bring music to the Sacred Heart Children's Hospital every week. As concert venues go, Rachel and Gracie's Playhouse is a lot brighter than the typical nightclub. The walls are splashed with original watercolors; the floors are a downright garish combination of light green and ocean blue. The electrified hues fit right in with the playhouse's surroundings inside the Inpatient Unit of Sacred Heart Children's Hospital. Every wall, window and sign seems an effort to sunny up the place where kids can spend days on end dealing with serious illnesses. Today there's an added attraction in the playroom, as Spokane musicians Scott Ingersoll and Miles Martin set up equipment for a 90-minute concert heavy on Disney tunes and pop hits. They'll follow up by going door-to-door to rooms where the kids might be too ill or too shy to leave, but still appreciate a rousing acoustic take of "Itsy Bitsy Spider" or Pharrell Williams' "Happy." In the playhouse, patients are free to come and go, along with their parents and hospital personnel, so the crowd can be upward of a dozen, or just a few. Right now, it's just a little girl from Post Falls named Lane Sanwald. "Are you a Taylor Swift girl?" Ingersoll asks. Lane shakes her head no. "Hmmmm... do you like Frozen?" A nodded affirmation and a smile. And with that, Ingersoll and Martin launch into what will be three different runs through "Let It Go" over the next three hours, encouraging Lane to shake a maraca or tambourine. Nurses working at the station outside the room are quietly singing along. 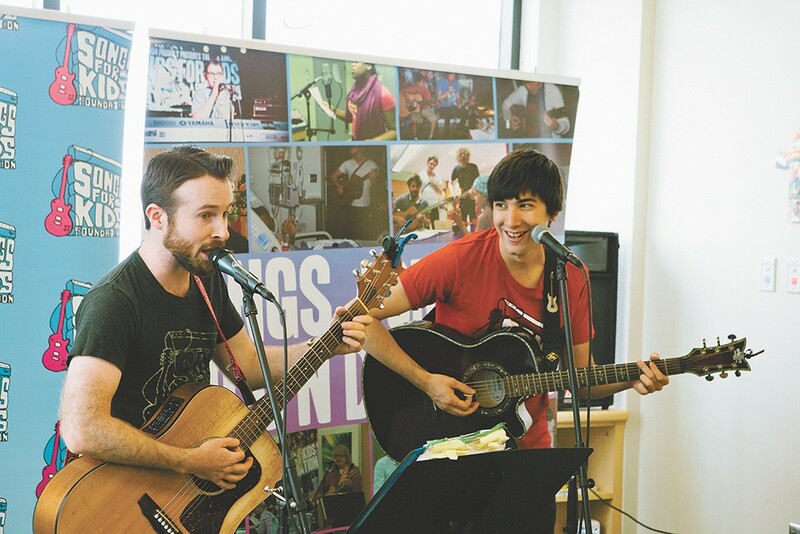 The musicians work for the Songs for Kids Foundation, a national nonprofit formed in 2007 in Atlanta by musician Josh Rifkind to bring music into the lives of kids suffering from serious illness. Since its formation, it's grown to include chapters in Los Angeles and Orange County, California, as well as Charlotte, North Carolina. Ingersoll launched the Spokane chapter when he moved to Washington after working for Songs for Kids in L.A. After several months getting to know his new town, he recruited some fellow musicians and got a weekly program started at Sacred Heart. Ingersoll grew up in a musical family and has spent a lot of time arranging music for churches and working with kids before he met Rifkind through a mutual friend. "We talked for a couple of hours and he explained what the foundation was, and I was just so on board with the mission of what they were trying to do," says Ingersoll. Strolling to the next stop to spread some cheer at Sacred Heart. Practically speaking, Ingersoll and his fellow musicians have to develop the ability to play and sing songs they might not be familiar with on a moment's notice; no one wants to disappoint a child with a Katy Perry request. There's a big Songs for Kids book full of classics — "Twinkle, Twinkle, Little Star," "The Wheels on the Bus" — that is always growing. "We try to keep up as best we can," says Ingersoll, who performs as Scott Ryan and in local bands including Water Monster; Martin plays in Friends of Mine. "If we get a request and it's something I can look up and get lyrics, we can pick our way through part of it. We try to stay up with as much of the Top 40 stuff as we can. That goes a long way, especially when you're playing bedsides and trying to cheer someone up. To be able to play some of their favorite artist, if not their favorite song, you can get them to smile a little bit." On this day, there are a lot of smiles as Ingersoll and Martin deliver everything from "La Bamba" to "Old McDonald," Taylor Swift to the Beatles. A "Beat It"/"Uptown Funk" mashup played at the nurse's station had people up and down the hall leaving their room to join the party. "That's a first," Martin says. "It's a meaningful gig," Ingersoll says. "Being able to play music and doing something that's meaningful — that's kind of rare." Bethany Sanwald, Lane's mom, saw Songs for Kids for the first time when Lane had her first round of chemo two years ago. Realizing there were people coming to the hospital to lift the patients' spirits was something that "until you're in it, you don't know it exists. It's amazing." And she thinks it means even more to her daughter.